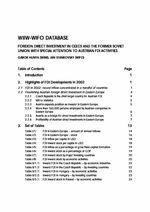 This 14th edition of the wiiw - wifo Database on FDI contains preliminary 2002 data for the Central and East European countries (CEECs) and the former Soviet Union (FSU). These are estimated based on the balance of payments for 9 to 11 months. It also makes a forecast for the year 2003. An updated methodological overview and a brief analysis of current foreign direct investment (FDI) trends in CEECs is provided. Special attention is devoted to Austrian direct investments in the region. The sources of data are official publications of the countries under survey. All data have been revised and the national banks of the respective countries were taken as the only source of reference. The data have been processed and commented on by Gábor Hunya (wiiw) and Jan Stankovsky (wifo) with the help of statisticians of both institutes (Monika Schwarzhappel, wiiw, and Gabriele Wellan, wifo). In this joint effort wiiw and wifo combine the overlapping parts of the two institutes' FDI databases. In addition to the tables presented in this publication, wiiw maintains a separate database concerning the performance of foreign investment enterprises in the CEECs, while wifo runs a detailed database covering FDI by Austrian firms and FDI in Austria. The joint database has also been analysed in separate publications (G. Hunya, 'Recent Impacts of Foreign Direct Investment on Growth and Restructuring in Central European Transition Countries', wiiw Research Reports, No. 284, wiiw, May 2002; G. Hunya, 'Uneven competitiveness of industries in the wake of foreign penetration of advanced economies in transition', Transnational Corporations, Vol. 10, No. 2, August 2001, pp. 35-66).